The DC515K 1/2 Gallon 18-Volt NiCd Cordless Wet/Dry Vacuum by DeWalt appears to be a quite a bruiser of a handheld vacuum. Is it worth it for the average user to buy, or is it really more for a construction site? And more importantly, does it work well in the first place? Let’s find out. The DC515K lives up to its appearance in its power – 18 volts are more than enough to surprise you with what this vacuum can pick up, from metal debris to pet hair. Moreover, that’s plenty for the wet messes the vacuum is also designed to clean – liquid can be surprisingly heavy in and of itself. I could make a list of what this vacuum has been known to clean well, but it would go on excessively – there’s a difference between a vacuum having power and using that power well, and the DC515K definitely uses its power well. A pile of metal shavings or even screws? Done. Water spilled on sawdust? No problem. It’s not even advertised for pet hair, and that gets sucked right up, too. The DC515K has two modes of use – not high or low like many vacuums, but with a front nozzle or extendable heavy duty rubber hose. The nozzle works well for spills on flat surfaces or low on the ground, and is placed in such a way that you don’t have to tilt your hand with the weight of the vacuum in it. The hose is two and a half feet long at its full stretch, and with a 1.25” diameter, you won’t have any trouble picking up even larger debris. It’s very useful for reaching into areas where the bulkier vacuum body cannot, especially in reaching up to clean into higher cabinets, for example. The NiCad battery this vacuum comes with admittedly doesn’t compare well to the more modern Lithium-Ion batteries out there… unless you look at the actual performance instead of the type of battery. A half hour runtime is the usual for the DC515K, which is enough for a handheld to be used for days or even a few weeks at a time given how quickly small messes are cleaned up. Expanding out a little, the charger that DeWalt includes will charge even a depleted battery in just one hour. That’s almost unheard of for cordless vacuums! On top of that, if you have other cordless DeWalt tools, their batteries can be switched out with this vacuum’s, and vice versa. 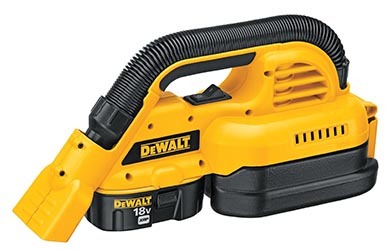 If you already have DeWalt 18V tools, you can get a bare version of this vacuum that doesn’t include the battery or charger to save about $50 – the DC515B. The DC515K vacuum weighs in at six pounds. That’s actually comparable to some lighter stick vacuums, but it makes sense when you look at what it is – it’s an 18V vacuum with a half-gallon capacity. There’s just no way it could be smaller and still work well. DeWalt includes a special Gore HEPA wet/dry filter with the DC515K. This has several advantages – one, the high quality filtration of HEPA. Two, it’s easy to tap or wash clean. Three, unlike many other vacuums, you don’t have to switch out the filter when switching between wet and dry messes. As was noted above, this vacuum has an astounding half a gallon tank for debris and liquid. As with the battery’s long runtime, you could potentially go for weeks without emptying it. When there are liquids to be cleaned, also, there’s a drain port that makes it very easy empty and to avoid spilling what you’ve cleaned all over again in doing so. The DC515K does not come with any accessories aside from the batter and charger, though its hose effectively works like an accessory in providing such a different mode of cleaning. Replacement filters and batteries are available, and remember that those batteries can be used with other cordless DeWalt tools. This vacuum is made for tough jobs, and everything about it is tough as well, from the latch that holds its tank on to the large (but still easy to use) on/off switch. Even the rubber hose with all its flexibility won’t kink or break! DeWalt sells this vacuum with one of the best warranties I’ve seen in a cordless vacuum. Not only does it come with a very long three year limited warranty, it also includes a one year service contract and a 90 day money back guarantee if it does happen to be defective that quickly. Yes, this vacuum is pretty pricey for a handheld. But if you’ve read all the categories we’ve discussed so far, it should be pretty obvious that DeWalt has designed the DC515K to stand right up there with their other cordless power tools – this is a tough, quality vacuum. DeWalt’s DC515K is definitely designed for workshops and contractors – it’s tough, it’s big, and it can take on challenging, heavy, and wet messes. That’s not to say it won’t be useful in the household as well, though – there are plenty of attics and basements out there that would be well served by a shop vac, but there’s just no getting a giant corded vacuum into that space. That’s where the DC515K comes in. And if you have a workshop and a home, so much the better!